The Kiwi Deluxe 7 Berth is a superior vehicle designed for the comfort of up to 7 people. The 2009/2010 model Mitsubishi Canter is complete with shower and toilet, hot water, microwave, cooker, CD player, air conditioning, diesel heating and much much more. Driven by a powerful yet economical 5.8L diesel engine. Anchor points can be fitted for baby/child seats. Kiwi Campers 2010/11 Mercedes Benz 6 Berth Deluxe is a fine example of European design on New Zealand roads. Seats/sleeps 6. Anchor points can be fitted for baby/child seats. A pleasure to drive, this motorhome is designed to accommodate 6 people or for a smaller group who want space and luxury. Driven by a powerful yet economical V6 3.0L turbo diesel engine with automatic transmission. 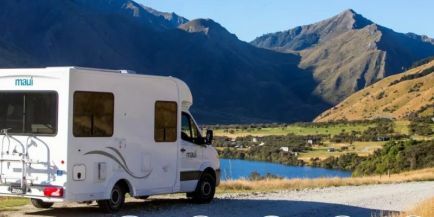 The Kiwi 4 Berth is a great vehicle for a family of up to 4, or a couple who want extra space. The motor home is a 2016 model Fiat Ducato T448 4 Berth, and is loaded with home comforts. Powered by an economical and powerful 2.3L Multi-jet 96kw/130HP Euro 5 diesel engine.. Maximum of 2 baby/ seats allowed in this vehicle. Client must fit the child seat themselves. The Kiwi 4 Berth is a great vehicle for a family of up to 4, or a couple who want extra space. The motor home is a 2015 model Fiat Ducato 4 Berth, and is loaded with home comforts. Powered by an economical and powerful 2.3L Multi-jet 96kw/130HP Euro 5 diesel engine Maximum of 2 baby/ booster seats allowed in this vehicle. Client must fit the child seat themselves.